Galveston Attractions And Lone Star Flight Museum. 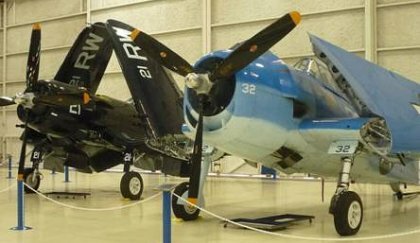 The Lone Star Flight Museum is one of the well known Galveston attractions. It displays many aircrafts of the World War 11 era . Most of them are still flyable today. The Flight Museum is located next to the Scholes International Airport at Galveston, Galveston Schlitterbahn and The Moody Gardens. The museum was started in 1985 as a private collection of historic aircrafts. The collection grew big by 1990, and the owner decided to turn it into a public museum funded by private donation. The museum suffered heavy damage from Hurricane Ike in 2008. All the airworthy planes were flown to safety but those left behind went through the storm. A repair section handles the damage aircrafts. The museum's collection often participates in airshows across the country. Some of the airplanes on display are Boeing/Vega B-17G, Douglas SBD Dauntless, Douglas DC-3, Supermarine Spitfire, MiG-21, # Douglas AD-1 Skyraider and many more. The museum also houses Texas Aviation Hall of Fame which honors native Texans for their contribution to aviation and spacecraft. A special souvenir area is also available in the museum. Flying time on the aircrafts including the bombers can be purchased by any one above the age of 18. Flying experience in the air lasts approximately 25 minutes. One can reserve a flight experience by calling toll-free 1-888-359-5736 or 409-740-7722. The museum is opened from 9am-5pm daily. Other attractions are unique but I will recommend the Flight museum to all aviation enthusiasts. A tour of the museum is $8.00 per person at the current moment. Here are some more photos of the Flight museum.